Thunderbird — To Be Magnetic™ | Manifest the life you deserve for less than a dollar a day. With today being such a potent one in the cosmos—FULL BLOOD MOON | ECLIPSE—I couldn’t think of a better way to celebrate than to share the oil that has brought so much medicine my way as of late. I introduce you to the epitome of NATIVE grooming, Jiva-Apoha’s Thunderbird. I wanted to create a blend that honors our Native American culture. We have beautiful local herbs, and plants that are resourceful for use right here that have been used for centuries in healings and teachings. The inspiration came during a few road trips through the countryside that manifested over a period of several months. Two particular journeys that finalized Thunderbird was spending time on a magical White Sage farm in the high desert. (It’s rare to find a farm that actually harvests Pure White Sage year-round. This treasure secured our clean purifying plant and essential into a beautiful relationship.) And the road trip that completed the creative elements was sharing time with my soul-sister whom is a powerful medicine-woman that lead the drive North as we visited our beloved friend, the Bear Clan Elder of the Mohawk Tribe. As guest we stayed on the reservation for a few days, and for their annual Pow Wow. The vision of transformation and energy from the sacred land became something that I knew all men and women would relate to. On my return home, my partner and I came up with Thunderbird for the blend. The Mythology of Thunderbird has a whimsical story–-our Sky Spirit lives in the Red Cedarwood Forest. It’s one of our staple organic, Native base oils, it's rich in Vitamin A, D, and extremely high in Vitamin E. This helps skin retain moisture. It’s also cooling, and adds a wonderful balance for Pitta(s). I personally use this oil year-round. Our Sunflower plant, in general, works hard for us. It’s one of my all time favorite flower powers! An herbalist taught me years ago that just by having the flower in the ground near the home or within living space helps to ward off radiation. Sunflower seeds carry strong antioxidant properties to help restore damaged cells, and to fight cancer cells. SO imagine all the goodness in this ONE oil and what it does for the tissues and body. I am Sunflower everything. In the Spiritual realm, White Sage is sacred and is used ceremonially for cleansing space. It’s a long-standing tradition in purification with the Native American tribes. Medicinal properties include (anti-inflammatory, antifungal, antibacterial), has been used for reducing fevers, throat, lungs, stomach, personal skincare, hair and body products. The “tree of inspiration”. Sacred to the Native Americans and used in ceremonies to nurture, and honor four directions. Medicinal properties include (antiseptic, antispasmodic, anti-inflammatory, diuretic, sedative), and has been used for infections, acne, cystitis, dermatitis, stress, oily skin, and medicine compounds. 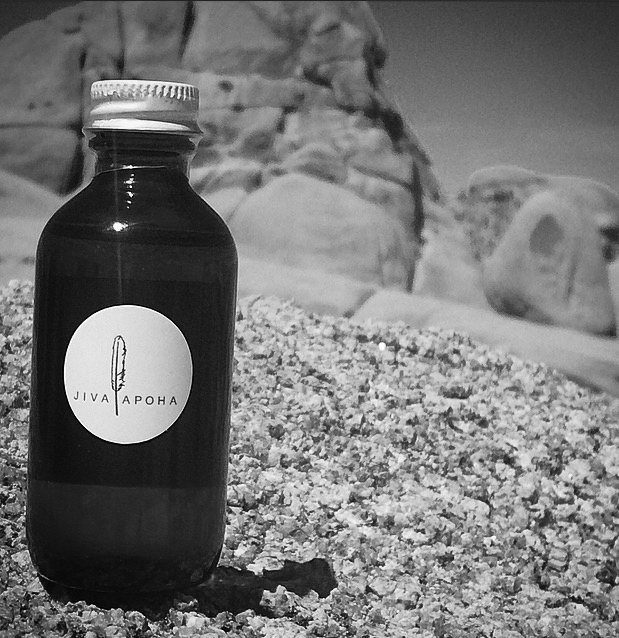 Our Native Americans used Juniper for medicinal applications, and burned the berries to cleanse and purify the air. Medicinal properties include (antiseptic, digestive, stimulant, detoxifying). And it has been used for eczema, rheumatism, as well as toxin build-up. Male and female, I encourage more men to join the club with moisturizing and protecting their skin. SO it’s a unisex blend, powerful for elevating spiritual awareness, and also attracts positive energy while the body absorbs the health benefits. It’s a Body Ritual. I like to especially honor this blend as a personal “Oiling” purification. A moisturizing application from neck-body-bottom feet to add in your morning and evening after a shower or bath. This routine will provide extra healing that is needed. All Four Seasons. All Four Directions. And outstanding for morning practice and meditation. If you don't have time to clear old or negative energy—as in a good Smudge through the day--this is one blend that you can wear for protection, or carry to use for behind ear, chakra, and wrist points to rid unwanted energy. I have a few: Atman Spirit, Thunderbird, 1967, Mukti Freedom, and a Personalized Oil that has (Sunflower, Sandalwood, Black Pepper, Rose, Black Jasmine, and Amber). I usually start with Atman or Thunderbird in the mornings, and at night I switch it up with my Personalized blend, 1967, or Mukti Freedom. I have also been using Parutka Joints in between, and especially on my knees. These oils work well for my body constitution and spirit. YES. The new Jiva-Apoha’s Bazaar. It’s all about Community Love. You will find Mohawk Medicine Bags that holds our 1967 Roll-On fragrance, and the Jiva Animal Incense Collection. Our Native Collaboration ThunderBird Medicine Bags handmade by Carol Nason Lindhorse of Old War Horse Moccasins. They have gorgeous energy! Our Holy Man Tees for women! Stepping out for nature walks and hikes. My latest grabs are Yogananda’s Whispers from Eternity, and Theory of Colours by Goeth. Now that we’re in Kapha Season, I incorporate NASYA – Ayurvedic nasal therapy with a special blend by Baidyanath for Spring allergies which also promotes clearing the channels to the brain. In Ayurveda they teach you—your nose is the gateway to the brain. Every morning, my new love Oil Pulling using pure coconut oil pulls toxins, is good for the liver, kidneys, gums, teeth, and helps boost energy for the day. More BALANCE between my work, relationship, family, friends, and making more room for new studies. I’m really big on Raw Organic Green Super Foods. My heart throbs for these creative brands such as Moon Juice’s Heart & Brain Dust, Sakara Life’s Amla, and Sun Potion’s Astragalus. In general, CQ10, Ashwangadha, Triphala, Tulsi, Liquid Vit. B12, Turmeric, Cardamom, Coriander, Cumin, Ginger, Kale, Basil, Lemons, Sunflower Seed Butter, and Manuka Honey. I support many beautiful brands, and friends within our Green Beauty & Health Community, all whom I admire to the core. Each brand is unique and has a story to tell. At the end of the day, it’s all-relative. We’re simply here to share the beauty of what we love to do and to help guide others. For me it’s creating pure love by getting to the roots, and making our world a better place within by developing a new kind of personal empowerment, ecological awareness, and higher consciousness that can really change anyone’s world. A holistic approach to beating everyone's most hated backlash of travel. The art of clearing stagnant and unwanted energy to make way for the new. Wisdom by Beauty by Britanie. O.G. scents and their vibrational impact. Mind altering, literally. The magic of using essential oils internally, topically, and aromatically for therapeutic wellness. Obsessed. Greer and I stumbled upon each others' Instagram some time ago and turns out we have the world in common. This super talented photographer, acrobatic yoga mama has some wonderful insight on healing with Essential Oils. I introduce you to Greer Inez of Mama Hussy. Hi there. I am Greer. I am a professional photographer [Greer Inez]. I have two little boys, and I write a lot about natural parenting + healthy living on my personal blog, Mama Hussy. In the last few years, I have started using essential oils in my house + with my family in order to keep us healthy + happy. We live in Oklahoma, and cold season + spring allergies can be brutal around here. While I try to fight the good fight by feeding my family nutritious foods, we still need that extra supplement to combat colds + allergies. And for us, that extra supplement is essential oils. I have replaced almost our entire medicine cabinet with essential oils. They rock my world! !